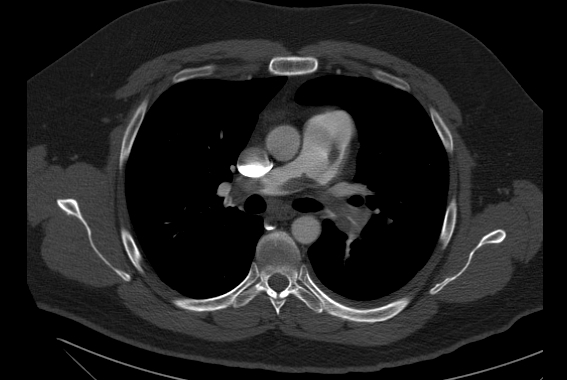 Acute pulmonary embolism (PE) presents diagnostic and management challenges to the contemporary vascular medicine specialist: PE remains a great masquerader given its protean, non-specific manifestations, and, in terms of management, guidelines describe use of only a few of the available therapeutic interventions besides anticoagulation. The need for data-driven therapeutic strategies is evident, but unlike other areas of vascular medicine and interventional cardiology, few randomized trials exist and future robust trials may be difficult to design and conduct. Compounding this difficulty is the urgency with which some severe, e.g. “massive”, PE patients require implementation of definitive therapy. On the other hand, while initially normotensive PE patients have lower mortality, they may exhibit latent RV dysfunction which may manifest downstream as debilitating pulmonary hypertension; thus the vascular medicine specialist must make a risk-benefit calculation that includes less well quantifiable parameters such as exercise tolerance, dyspnea, and quality of life. In assessing the practices of modern PE therapy, comparisons may be drawn to both urgent medical response systems as well as multidisciplinary heart teams. With regard to the former, rapid response teams have generally been implemented nationwide as a means to quickly mobilize expertise and resources for deteriorating patients. Examples of this analogy are the protocolized responses for ST segment elevation MI and stroke. Cardiovascular practitioners are also familiar with multidisciplinary teams for transcatheter aortic valve replacement, which amalgates the experience of cardiologists, cardiac surgeons, interventionalists, echocardiographers and radiologists, and anesthesiologists. Out of these analogies, and as a response to assessing and reducing variation in care of PE patients, the PERT – Pulmonary Embolism Response Team – was born and launched October 2012 at Massachusetts General Hospital (MGH). The aim of PERT is to provide an expeditious and coordinated analysis and management opinion on complicated PE cases derived from a multidisciplinary consult so as to optimally use all available therapeutic interventions. The Massachusetts General Hospital PERT is activated with a single page by a referring clinician, whereupon a vascular medicine fellow evaluates the patient with history, exam, and review of available data including electrocardiogram, CT scan, ultrasonography, and laboratory tests. Based on PE severity and management questions, a virtual case conference with discussion of clinical data and imaging is convened via commercial meeting software, with participation by PERT-affiliated vascular medicine and intervention specialists, cardiologists, cardiac surgeons, echocardiographers, radiologists, and hematologists. The referring physician is included in the online conference, so that recommendations can be immediately conveyed and implemented, especially as regards systemic thrombolytics, catheter-directed thrombolytics and pharmacomechanical strategies, and surgical and mechanical circulatory support options. In 2 years of existence, MGH PERT fielded 300 consultations. At a system level, PERT aims to collect data and study the therapeutic outcome based on the presenting PE phenotype, as a means to advance the science of PE diagnostics and management. Detailed clinical data is being prospectively collected in an IRB-approved online repository. Interested institutions are invited to work with the MGH PERT to develop local PERT programs, to collaborate on creating a broader network of PERTs, and to grow a clinical database that may augment understanding and tailoring of PE interventions.